Hello! Today I have a card to share that I created with the new My Favourite Things Jungle Friends card kit! This fun, jungle themed kit includes everything you need to make a ton of cards including a stamp set, 2 die-namics sets, patterned paper, cardstock, and 1 package of Spin & Slide discs. And the best part... everything is perfectly coordinated together so all you have to do is create! The kit officially releases tomorrow night at 10pm and you can find all the details about the kit and how it works on the MFT blog. For my card today I used the kit products to create an outodoor scene with pink elephants. ;) I love pink elephants... even if they don't exist in real life lol! I diecut the elephants, grass and water pieces from white cardstock and then used distress inks and an ink blending tool to add colour to all of the pieces. I love adding colour this way because you can easily add shading and dimension. Once I had all of the pieces covered in ink, I spritzed some water on them (since distress inks react to water) to create a fun distressed look. I adhered all of the pieces onto a white cardstock panel that I lightly inked with blue ink (for the sky) and then I adhered the entire panel onto a grey card base. I completed the card by stamping the sentiment onto the sky area with black ink and adding black gems for the elephants eyes. Gorgeous, gorgeous card Stephanie! MFT has outdone themselves with April's Card Kit, so much fun to have. Thanks for sharing your creation as I do love the depth of colour you have achieved. One to aspire too! What a beauty! Love this cutest scene with cute elephants! Love distress inks! You get the most amazing effects using them. What a beautiful card! So cute! I love the pink elephants! Oh, pink elephants! :) Love them! Very cute...like the coloring & spritzing!! Wow ... these pink elephants really have that wow factor! Great job. LOVE these bright pink elephants! ADORABLE! The cutest pink elephants I ever did see. All the MFT designers are so creative! 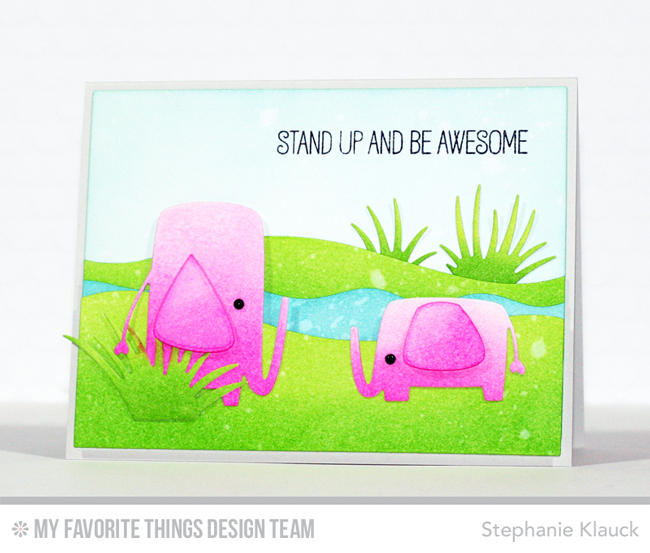 Adorable pink elephants! Love your card. Beautiful! Such great colors! I love the saying! An amazing job. The pink elephants are adorable. I love the bright colors of the distress inks! Super cute! What? Pink elephants don't exist in real life??? Say it ain't so! ;-) I love them in pink too, and these guys are too cute. Love the black gem eyes and the river you made for them! I love your pink elephants, they made me laugh! Those happy colors really bring your card to life in a fun way! Great design - you really can't help but smile at this card. 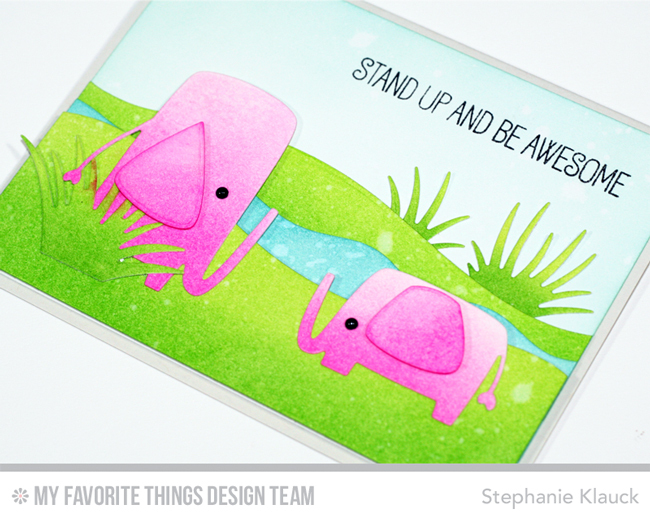 Totally awesome pink elephants (card)!